Boxing promoter Artie Pelullo found himself in Moscow smoking a cigar and drinking vodka before noon, talking about a hard-punching, soft-spoken fighter from Siberia. At the time that boxer, Ruslan Provodnikov, had perhaps the world's worst commute. It was at minimum, a harsh 10-hour trip from Beryozovo, Siberia, a small town of about 7,500 where Provodnikov was born and raised, to Moscow, where he would learn to fight. Pelullo, a Philadephia native, had never heard of Provodnikov when he hopped on the plane. What he'd heard about was a motherlode of largely undiscovered Russian boxing talent in the nation's capital, and since very few promoters in North America paid attention to what was going on in Russia, the industrious Pelullo decided to take a chance. "I figured it was worth checking out, and if things didn't work out, at least I'd have some good stories to tell," said Pelullo, one of boxing's best anecdotalists. After the long flight from Philadelphia, Pelullo finally reached his hotel in Moscow. He wanted to go to his room, clean up and relax for a while. But the Russian boxing promoters he was to meet were sitting in the lobby at 10:30 a.m. waiting for him. "I was all dressed up, wearing an Italian jacket, and I'd traveled this great distance," he said. "I wanted to go to the room, get a shower, rest up a little, get something to eat and then talk to these guys." But the meeting occurred on the spot, and the men bonded as they chatted boxing over vodka and cigars. They regaled Pelullo with tales of the fighters' abilities, which set off alarm signals. The last thing Pelullo wanted was to be involved with a scam, and this all sounded too good to be true. As it turns out, though, the fighters who ultimately would sign with Pelullo were vastly better than he had imagined. One of them, Dmitry Pirog, turned out to be a magnificent fighter who won a middleweight world title. Pirog has suffered a series of serious injuries, though, and hasn't fought in 18 months, with his career in jeopardy. One of the others was Provodnikov, who on Saturday at the 1st Bank Center in suburban Denver will meet Mike Alvarado for the WBO 140-pound title in a bout televised on HBO. Provodnikov comes from Beryozovo, a small village near the Arctic Circle, about 1,700 miles northeast of Moscow. The temperature struggles to tickle 60 degrees Fahrenheit in the summer, and in the winter, it can dip down to minus-50 Fahrenheit. That is cold enough to freeze gasoline. Somehow, Provodnikov managed to make it out. 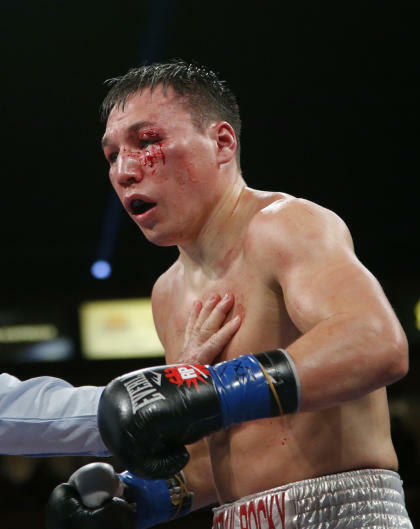 "I have always wanted to be a boxer, and I worked very hard at it, but I knew if I wanted to be taken seriously, I had to get to the United States," Provodnikov said. He loved the U.S. upon his arrival, but he didn't quite show the immense potential he would later. He worked with a series of trainers, notably Buddy McGirt, and was unable to click with any of them. He was fighting a lot of mid-level opponents on small cards and wasn't making a lot of money. After a close 2011 loss to Mauricio Herrera, it seemed that Provodnikov was headed nowhere quickly. He was a pulverizing puncher, but there was little else to his game. One of his managers brought him to Freddie Roach's Wild Card Gym, and there, he went through a renaissance of sorts. Roach was awed by Provodnikov's power, and knew instantly he would become a key sparring partner for Manny Pacquiao. Provodnikov was one of the few sparring partners Roach had ever found who could not only take Pacquiao's punches, but push Pacquiao back with his own power. "He has that crazy, natural punching power," Roach said. "He hits you and I don't care who you are, you are going to feel it." Even though he began to perform better with Roach, not much good seemed to be happening in his career. But Pelullo ran into Pacquiao promoter Bob Arum and Pelullo suggested Provodnikov when Arum was looking for an opponent for Timothy Bradley. Bradley had just beaten Pacquiao in a highly controversial decision, and the public was outraged. Arum thought after talking with Pelullo that a bout with Provodnikov made sense and pitched it to officials at HBO. After originally turning it down, HBO executives changed their minds and, with it, at least one man's life. Provodnikov floored Bradley once, and could have been credited with two other knockdowns, in a March 16 battle that remains the frontrunner for Fight of the Year. Though Bradley won the decision, Provodnikov had earned a following. Arum was so excited pitting him against Alvarado – another one of the sport's most entertaining fighters – that he almost lost his cool on a conference call. As it started, Arum's tone was measured as he predicted a great fight. "There is not much I can say as a promoter," Arum said. "You don't have to sell this fight. Everyone who knows anything about boxing knows that this fight will be a candidate for 'Fight of the Year.' Two great warriors. Two guys who entertain the public. You don't need a sales pitch for this one." As reporters quizzed Alvarado and Provodnikov, Arum became frustrated. He'd seen Alvarado in two spectacular battles with Brandon Rios and in a bout with Breidis Prescott he compared to a Rocky movie. Arum also had seen Provodnikov, when he fought Bradley, put on as raw a display of power punching in a bout since perhaps George Foreman met Ron Lyle in 1975. He didn't have the patience to deal with the questions to the fighters. He seemed to want to show them a highlight package, knowing it alone would sell the fight. "We all know it's going to be a great fight," Arum said. "We don't have to keep asking the same questions over and over again. … They are going to come to fight. Yeah, there will be some good boxing, [but] what we are going to see is really a knock-down fight." That would be fine with Provodnikov, whose concussive power gives him a decided advantage whenever a bout turns into a slugfest. Alvarado is good in that regard, as well, but Provodnikov welcomes the brawl. 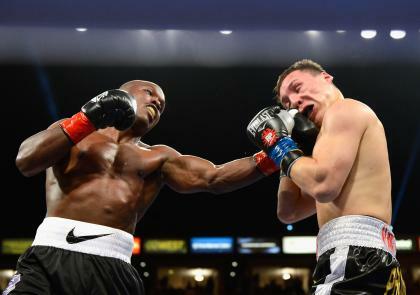 "If you thought my fight with Bradley was a good one," Provodnikov said, "wait until you see me fight Alvarado."